An aside: I find it to be a personal obligation to mention the untimely passing of Bill Paxton, whose consistently vivid performances will be sorely missed within the cinematic landscape for years to come and to whom I tip my hat. Fortunately, his hard-bit turn in Nathan Morlando’s slice of rural neo-noir, Mean Dreams, wonderfully encapsulates why he was so damn good. At the same time, I also feel it is my responsibility to look at the film around him, and objectively consider its craft and impact without the need to tiptoe. Nathan Morlando’s second feature, penned by first-time writers Kevin Coughlin and Ryan Grassby, is a thriller both intimate in scale and raw in execution. 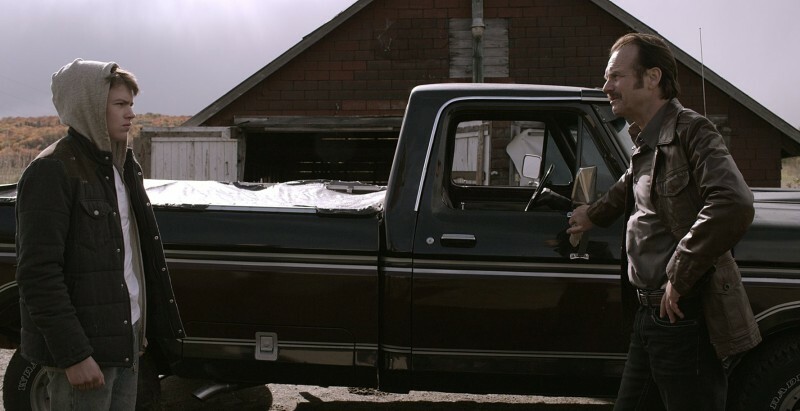 Casey Caraway (Sophie Nélisse) has just moved into a farmhouse with her father, Wayne (Paxton), who has more bark and bite than their dog — and also happens to be a cop. She soon runs into her neighbor, Jonas (a fiercely committed Josh Wiggins), and the two strike up an instant connection. But Wayne is an abuser, and when Jonas witnesses an act of violence committed against his new friend, he intervenes. This sets off a series of consequences, as Jonas and Casey flee with the hopes of youthful freedom keeping their heads in the clouds, and a fat bag of Wayne’s blood money keeping their feet on the ground. Early on, Wayne threatens Jonas with a bloodhound’s gaze that it’s “gonna get mean.” And while Mean Dreams stumbles once or twice, it is a thrillingly dark fable draped in beautiful images and a layered, menacing performance from Paxton. Mean Dreams is aware of the genre’s trappings, but, for better or worse, it doesn’t let that knowledge turn it into an exercise in reflexivity and subversion for its own sake. The story goes where the two young protagonists take it as they stumble awkwardly, trying to outsmart an enemy two times their age and three times as mean. While this occasionally creates narrative beats that fail to surprise or intrigue, Mean Dreams has strong moments where expectations are subverted successfully, most of which involve Paxton’s terrifying performance. His character’s approach to situations creates a raw sensation that makes the story function effectively as a twisting noir-ish thriller while also grounding it logically within its premise of “two kids who don’t really know jack try to run from a cop that’s out for blood.” This is a wholly necessary component, for the film doesn’t focus on the minutiae of being on the run quite as much as it should. Once things get underway after an idyllic and quiet beginning, there is an earnestness and simplicity to the presentation that successfully mirrors the protagonist’s state of mind. Jonas is naive, and at first, he lays all his cards out on the table with depressing clarity. No one listens to him — hell, they even threaten him — yet he tries to deny the dark places he needs to go to protect himself and someone he cares about. With Wiggins’ performance, these moments become crushingly real, as he depicts the frustration of a young boy struggling to comprehend a world that doesn’t function based on his hopes for it. The film itself adopts a similarly sincere style, laying its cards out on the table through its technical trappings. During emotional scenes, a bittersweet melody chimes. During sequences of menace and tension, the score thumps and shrieks, forcing the audience into a state of discomfort. While some may scoff at this clear-cut style of cinematic discourse, Mean Dreams manages to earn most of these beats by allowing performances to remain the central focus. Its style rarely gets in the way of the humans at its center, a sign of form and content being effectively melded. That being said, cinematographer Steven Cosens‘ should be noted, as it fills every frame with gorgeous lighting and a confident aesthetic sensibility. Early on, the lens takes an almost Terrence Malick-like style of freeform idealism, drifting to-and-fro as it captures budding romance amidst fields of green and setting suns, even if the effect laid over the opening shots looks a bit too much like an Instagram filter. This captures the innocence of its protagonists, who, damaged as they already are, have a sense of frivolity still very much alive. Once things get mean, the camera adopts a more clinical approach, sucking the audience inwards as the characters are thrust into the cold reality of violence around them. Yet beauty is found beyond this violence, which itself is never celebrated — and always studied for its impact on its victim, without discrimination. This examination is a reason Mean Dreams stands out from countless other hard-edged, backwoods thrillers: it cares about characters and what happens to them. Namely Casey’s abuse, which is never played for exploitation due to the film’s unwavering focus on her reactions. This allows her trauma to be laid bare for the audience to take upon themselves, and her catharsis when facing her abuser is made all the more powerful for how Mean Dreams acknowledges that, no matter what we do on this cold earth, we’re all human beings. Mean Dreams will open in limited release on March 17th.